Home > Press Releases > CrakRevenue’s “December Challenge” is Back! (Quebec City, QC) November 26, 2018 – CPA Network CrakRevenue is offering bonuses of up to $7,500 if affiliates can top their November 2018 earnings this December. Québec City-Cost-per-acquisition network CrakRevenue has announced the return of its yearly “December Challenge,” a seasonal fan-favorite and an opportunity for CrakRevenue affiliates to take home some serious bonuses come January of next year — that is, if affiliates can beat their November 2018 CrakRevenue commissions this December. “Winter has always been really lucrative for affiliates and our annual Winter promotion is no exception for affiliates wanting to make the most out of this exceptional season,” says Maxime Bergeron, Affiliate Sales Director. Indeed, the December Challenge 2018 has a little twist with various levels to climb represented by different elves. In addition to these levels, this year’s challenge is brought to you by CrakRevenue’s Customer Experience Team – a team dedicated to helping new affiliates participate in the challenge. This promotion is also a good opportunity for advertisers. 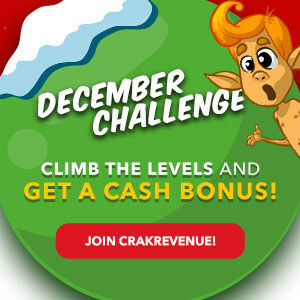 Affiliates and advertisers that would like to participate in the challenge can find out more info about the levels & Challenge Terms & Conditions on CrakRevenue’s official Blog: https://crakrevenue.news/December-Challenge-Info.